Cruz spectators were treated to a goal-fest as Saloma fired shot after shot. 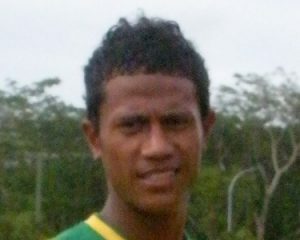 Teammate and Cruz captain Penitito Tumua topped it off with the matches final goal in the 73rd minute. Not to be out done, competition leaders Moaula United went on a goal-scoring spree in their 6-3 victory over Togafuafua Saints. To’o (Fereti) Gosche and Spencer Keli scored two goals each but both fell short of a hat trick. The younger Gosche’s, Fitu and Luki also joined in with a goal each. Unfazed, Togafuafua put up a gutsy fight. Pualele Lemana led the charge and was twice rewarded. Judging from last weekend’s performance, Togafuafua may be on track to make a comeback in round two. 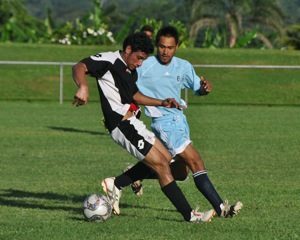 Another team that has improved remarkably is Vaivase-Tai; now in sixth position after their outstanding nil all draw with Apia Youth. Vaivase-Tai played a fast-paced and smart game but couldn’t connect on key goal-scoring moments. Moataa were first to score but appeared to loose their footing in the second half as Adidas increased their lead. Meanwhile, third-placed Kiwi SC’s nil all draw with fifth-placed Goldstar Sogi FC, set them back in their pursuit of the top spot.